Mrs. Kelly: [as Ned is about to be taken to the rafter] Mind you die like a Kelly, son! Not a total write off. Hopefully we will be lucky enough to see an improved installment sometime soon. The criticism this film seems to receive every few years is quite intense. After viewing it, however, I feel that the comments made by the most vocal of critics are unwarranted. 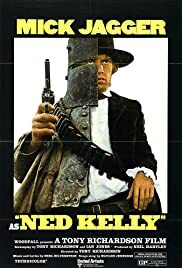 Had the movie been an entire work of fiction and the Ned Kelly saga made up as an original screenplay, then many may have applauded this movie. The movie can definitely be enjoyed as a work of cinematic art, but obviously as an ode or anthology to the life of such an important Australian historical identity it can do nothing but fail in the telling of Ned Kelly's story. Hopefully, however, Neil Jordan's upcoming offering may get closer in creating such a testament. On cinematic terms, NED KELLY it is somewhat enthralling, though it does fail to hit the high-note. For this, I can pinpoint no one particular error so it must instead be a combination of many. People will want to know whether Jagger acts well. Surprisingly, I think this is hard question to answer, but it is the least of our worries here. The direction is rather adequate, though some scenes are quite nicely photographed -especially the end shoot-out. The editing at the start is quite impressive. The first major miscalculation, of course, are the problems encountered when casting a slim, Englishman as the sturdy protagonist who is supposed to be an overwhelming 6'4 Irish-Australian. This miscasting is confounded with Jagger's pathetic attempt at a full-grown beard which makes our hero - or anti-hero - look Amish. The trailer's claim that `if Ned Kelly were alive today.he'd probably be Mick Jagger', therefore, is quite arguable. There is also an over-abundance of soundtrack music. I have no reservations about that. Most of lyrics to the folky, country soundtrack act as direct commentary to the proceedings of the story we see or are asides that relate directly to it. Almost instantaneously it becomes repetitious and highly corny. The biggest problem is, however, the lack of any serious character development. The film concentrates mainly on Ned and gives a little consideration to Dan, Steve and Joe, who in reality were as much a part of the gang as Ned was. The development is so negligent that barely even lip service is paid to identity of several key characters. You can be forgiven for not knowing that the man shot in the groin was actually a member of the Kelly gang! In conclusion, the film gives itself no chance of a being remembered as a classic. It would be nice, perhaps, if the film had of been directed by an Australian. No, forget that. A Victorian.